The majority of the populace in the US today has little knowledge about the role that the 47 million hunters, fishermen and trappers play in keeping our magnificent, wildlife populations healthy. Nor are they aware of sportsmen’s unrelenting support for evidence-based scientific wildlife management and conservation. Finally research has identified that the general public does not understand nor appreciate the positive economic impact that activities such as hunting and fishing have on their local economy and the U.S. economy, as a whole. Over the years, the public’s attitude has been inappropriately misdirected and inaccurately shaped by emotional rhetoric and purposeful misguidance from well-funded animal rights organizations that do little to ensure that we continue to have abundant, well- managed wildlife populations for all of the public to enjoy. “Not since the first hunting license was issued, not since the first bag limit was established, not since the first protection of wildlife habitat was instituted, has there been such a revolutionary program to protect wildlife populations and sportsmen’s heritage, while safeguarding future generations hunting and fishing opportunities.” Those were the words of Alan Taylor, chairman and co-founder of the Nimrod Society, in 2005, as he described the proactive, public education program initiated by Colorado sportsmen and its newly-formed “Wildlife Management Public Education Advisory Council”. An effort that has transformed the landscape for the citizens and sportsmen of Colorado. After years of effort those words ring true today in the state of Michigan thanks, in part, to the Nimrod Society and State Representative Jon Bumstead. 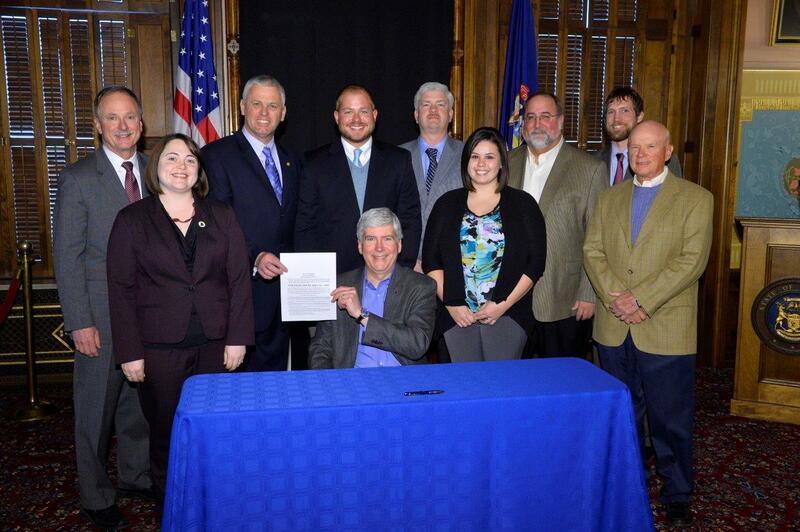 Michigan Governor Rick Snyder signed the Michigan Public Act No. 246. This legislation established the Michigan Wildlife Council, whose sole purpose is to educate the non-hunting and fishing public of many values that traditional, consumptive recreation activities, like hunting and fishing, contribute to society and the economy. Beginning March 1, 2014, a surcharge of $1.00 per hunting and fishing license will be collected and dedicated for exclusive use by the Michigan Wildlife Council in educating Michigan’s citizens about these values. With this important victory in Michigan, the Nimrod Society is evaluating what other states might be ready and willing to embrace this exciting, pro-wildlife, pro sportsmen, legislative model. With two states down, only forty-eight remain! For more information click the ”Colorado Model” link, delivering you to an exciting 10 minute visual summary of the successful Colorado program upon which the new Michigan program will be based.